Individuals with FXS and their families have a variety of needs but they may not always receive the services and support they need. To take a closer look at this issue, OFXW researchers reviewed research done in the past 10 years on the unmet clinical needs and burden in FXS. Researchers outlined the strengths and needs of individuals with FXS. This included intellectual and functional abilities, social-emotional behaviors, and other co-diagnoses such as autism spectrum disorder. On average, about 60% of males and 40% of females take symptom-specific medication to treat problems associated with FXS. However, between 20% and 30% of caregivers of males reported that medications had little to no effect. Child behavior was found to have the most profound impact on the family and caregiver's quality of life. Families who have a child with FXS experienced greater health care costs and financial burden as compared to families without a child with FXS. Indirect costs included the impact on employment/careers, with caregivers taking about 18 hours off work in the last month and some reported that they quit their job, turned down a promotion, or changed working hours or jobs in order to care for their child with FXS. A subset of families reported not enough social support, and more parenting stress, depression, anger, and anxiety. This review found that there continue to be unmet clinical needs in FXS. Additional treatment options are needed to address these needs and minimize the impact on families. This research was done by OFXW researchers, Drs. Melissa Raspa and Don Bailey. 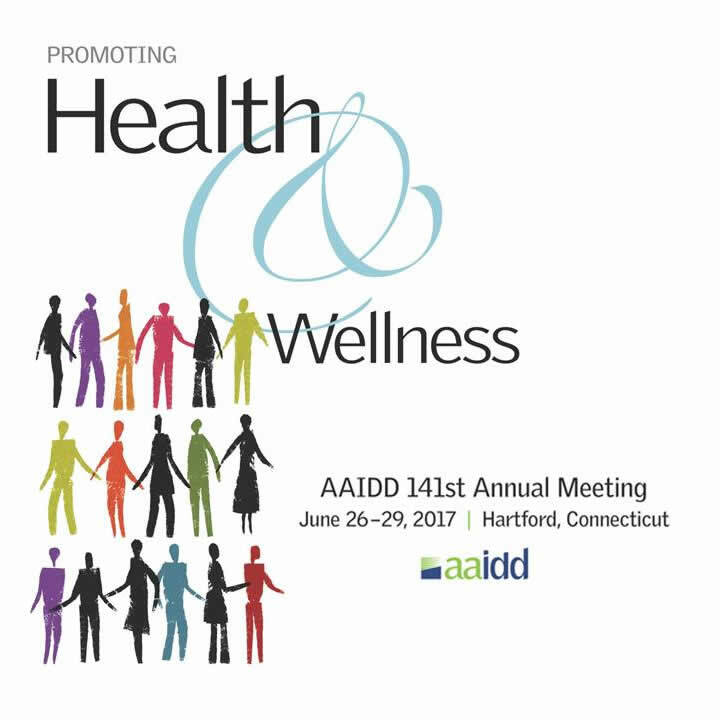 Co-authors included Patricia Sacco of RTI Health Solutions, and Jeannie Visootsak and Raquel Cabo of Ovid Therapeutics. Ovid Therapeutics is a biopharmaceutical company focused exclusively on developing impactful medicines for patients and families living with rare neurological disorders. 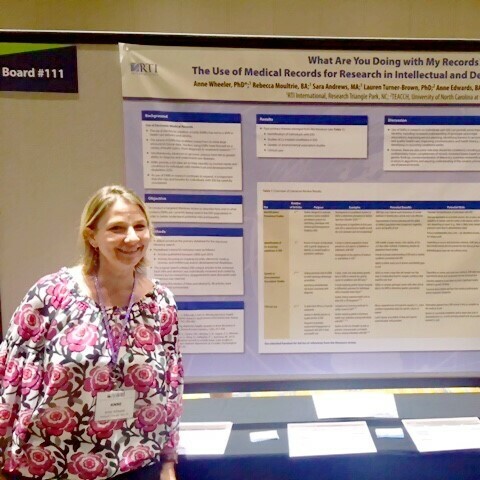 Anne Wheeler presenting a poster at the AAIDD 141st Annual Meeting. Photo courtesy of Anne Wheeler. Studying medical records can tell us more about the clinical needs of individuals with FXS. Although medical record data can help us improve clinical care, researchers and practitioners must consider both the risks and benefits of using medical records for research purposes. Using medical records for IDD research can provide important benefits. Findings suggest that these benefits can include an increased understanding of IDD conditions, identifying where there may be barriers to obtaining services or quality health care, improving communication with providers about IDD, and identifying health conditions that also affect individuals with IDD. The literature also pointed to the risks of using medical records for research, including potential privacy and confidentiality issues, the incompleteness or inaccuracy of records, the possibility of stigmatization, and concerns that families do not understand what their participation in medical records research means. Medical records hold a wealth of information that can be used in variety of ways. Further exploration of individuals and families' views on using medical records for research purposes is an important step in determining how the IDD field can benefit by the use this information. This research was done by OFXW researchers, Dr. Anne Wheeler, Rebecca Moultrie, Sara Andrews, Dr. Lauren Turner-Brown, Anne Edwards, Laura Wagner and Dr. Melissa Raspa. Learning more about individuals' and families' views on using medical records for research is a key step in finding out how to conduct these studies ethically. We plan to use what we learned from this research as the basis for our upcoming survey on preferences for use of medical records in research. We'll post the link for the survey later this fall, so please stay tuned! If you'd like to be contacted about this upcoming study or other ways to take part in FXS research, please think about signing up for our research registry. What do you think we need to do to promote a society that fully includes individuals with FXS? What do you think professionals need to know more about? Please consider sharing your thoughts with us. We hope to hear from you! Rebecca Moultrie is a research analyst at RTI International. Her research focuses mainly on helping patients make informed healthcare decisions.